14,255 ft high Longs Peak reflects in a unusually placid Chasm Lake. 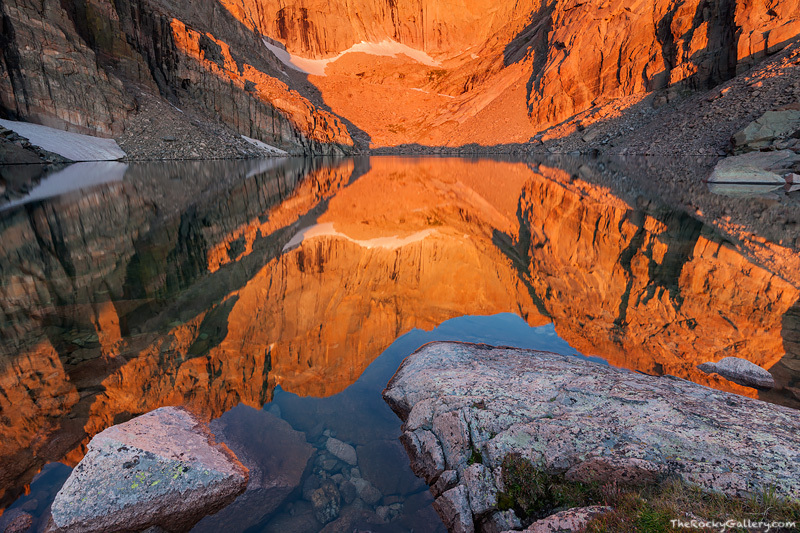 Longs Peak's famous Diamond can be seen reflecting in a windless Chasm Lake in Rocky Mountain National Park. Colorado is host to 54 peaks that reach 14,000 ft or above and Longs Peak is both the northernmost 14'er, and the only peak in Rocky Mountain National Park that is higher than 14,000 ft above sea level. I was very lucky when I arrived this morning to find the wind which is almost a constant companion this high up to be non-exsistent. Photo © copyright by Thomas Mangan.